Build the app or bot of your dreams, in minutes. Everybody has good ideas of things we want to make on the Internet. But honestly, it’s gotten too hard. Gomix fixes that. If you’re not a professional developer, the barriers are way too high. There are pretty good tools if you just went to make a marketing website or a blog, but if your idea is an app or a bot or something more interactive, you’re out of luck. It ought to be as easy to make an app as it is to edit a blog post or to change a formula in a spreadsheet. Even if you are a professional developer, it’s easy to spend most of your time messing around with setup and configuration tasks that keep you from building what you actually want to create. Think of Gomix as sort of an App Store connected to CodePen connected to Heroku, and that gives you an idea of what’s happening behind the scenes. While Gomix was under development as HyperDev, you might have heard one of your developer friends say how cool the platform is — now it’s time to check it out. With Gomix, you don’t have to manage the confusing or complex parts of creating an app or bot. You start with a working app, hosted on the latest cloud infrastructure. If you’re an advanced developer, you can just start with your favorite web frameworks (it’s regular Node.js, but without any of the hassle.). From there, you just remix these working examples into the app of your dreams. To remix an app, you simply edit the code live in your browser. As soon as you make a change, it’s pushed live to your app, instantly. And while you’re making changes, you can have multiple people editing at the same time, even on the same file — it’s like Google Docs for editing code, which makes it great for teaching or pair programming. Perhaps the best thing about Gomix is what we’ve left out. There’s no provisioning of servers, no version control to learn, and no lock-in: every app on Gomix runs on completely standard infrastructure that you can use on any cloud hosting environment. How do we know Gomix will meet the needs of developers? Well, we’re Fog Creek Software. Our cofounder Joel (“On Software” is not his literal middle name) Spolsky is one of the most respected and influential voices in programming, as his Joel on Software blog helped define a lot of the best practices that have since become industry standards. In 2007, we teamed up with Jeff Atwood to make Stack Overflow, the indispensable tool that answers every developer’s questions, and in 2011 we made Trello, the essential planning tool that uses cards to provide a clear visual layout of any project. Since then, Trello and Stack Overflow have spun out into their own independent companies, but our company still has that same DNA that lets us help ordinary people make extraordinary things on the Internet. And basically, Fog Creek has had an impact on developer culture that rivals companies 1000 times our size. 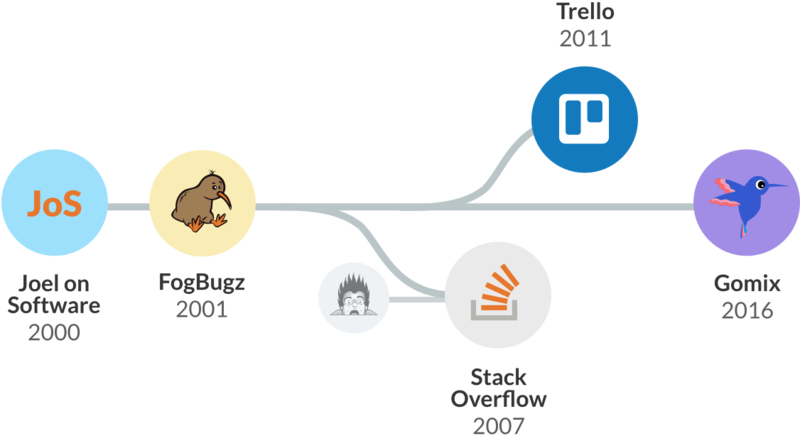 We’ve launched some pretty great stuff over the years, including spinning out Stack Overflow & Trello. Now Gomix is the latest! And alongside this major company milestone, we’re excited to announce our newly-named CEO, Anil Dash. Though he’s best known today as one of the industry’s most prominent voices for ethics and inclusion in tech, we’ve known him first as a Fog Creek fan, customer and community member for over 15 years. Anil co-created Makerbase, a community and directory for people who make apps and sites on the web, with Gina Trapani last year, and we’ll be giving it a home at Fog Creek. We still see it as vitally important to talk about the human factors that come with creating technology, and to invest our time and energy into making sure everyone gets to be part of creating software and the Internet. Now more than ever, the barriers to creating tech have to be torn down, and we’re excited to take our next big step. We can’t wait to see what you create! Give Gomix a try right now, for free.